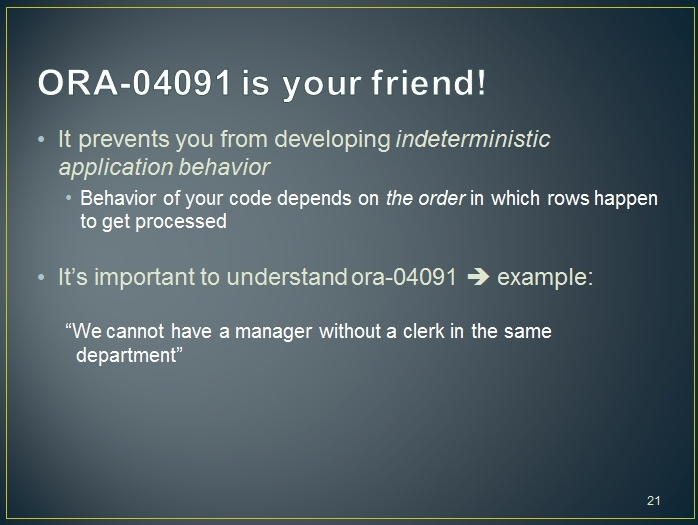 We wanted to implement the following business rule: "Cannot have a manager without a clerk in the same department." At the end of this post, we tried implementing that using a straight-forward row-trigger, which introduced us to the mutating table error. And we've explained thereafter (here and here) that this error is there for a very good reason. We've also clarified that the two common 'workarounds' 1a and 1b really should not be used. 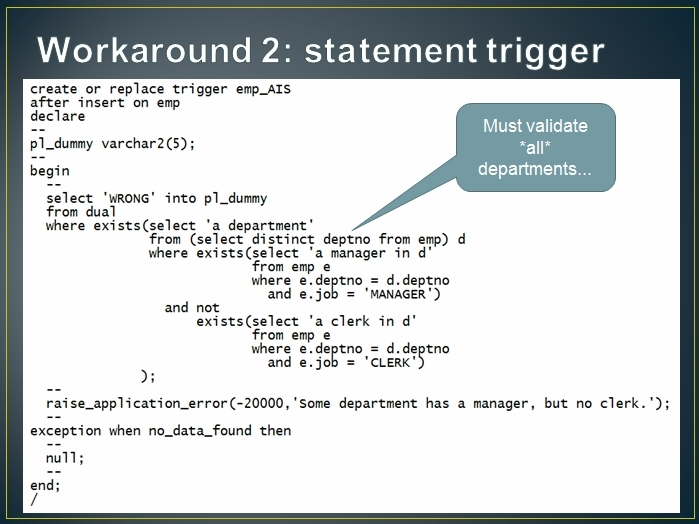 So using a row-trigger to check for a clerk whenever a manager is inserted will not work. Remember the reason we wanted to use a row-trigger is because in it we have available :new.deptno which represents the department into which a manager just got inserted. This enabled us to efficiently check only that department for the necessary clerk. So what about a statement trigger then? 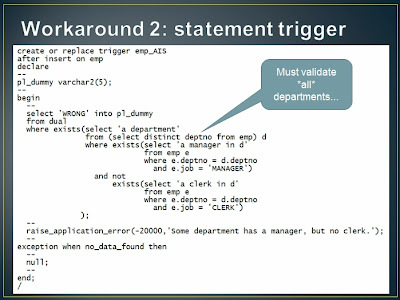 Obviously it forces us to validate all departments, since within the context of the after insert statement trigger, we do not know anything about the actual insert(s), other than that some insert took place. 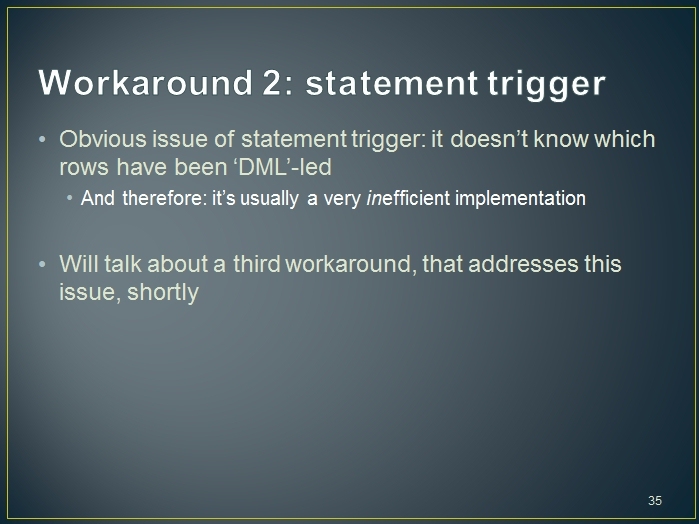 Above is an attempt to implement our rule using the after insert statement trigger. As you can see we validate all departments. This is not a very efficient solution to implement our business rule. Not only do we validate all departments, we also validate them on all types of inserts. 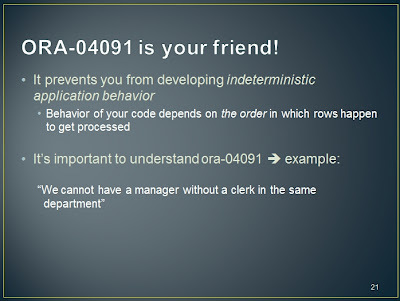 Obviously when we insert, for instance, a trainer, there is no need at all to validate this rule (assuming the rule was fine, before this insert), since inserting a trainer cannot violate this rule: such an insert doesn't 'touch' the rule. 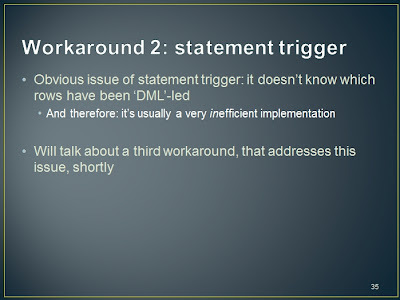 We will explain in detail how to a) workaround the mutating table issue + b) get an efficient (and correct) implementation for our rule using a statement trigger in multiple future posts. But before we do that, we'd like to spend some time on common use-cases of triggers, and why they gave rise to the general consensus out there of triggers being harmful.